I felt it coming on Wednesday, by Thursday night I was sure. I was coming down with the dreaded ‘rhinopharyngitis vir’. Or as it is more commonly referred to, ‘A man cold’. While it was touch and go there for a while I seem to have pulled through the worst of it.Today I am finding myself feeling more refreshed and grateful to be alive and well. It is in that spirit that I write this blog. I want to help men everywhere deal with this dreadful illness. Definition: The man cold is a debilitating virus that only affects the Y chromosome. Male children seem to be generally immune until they reach puberty. Symptoms: Your head aches, your throat is scratchy, your skin feels icky, your nose is both stuffy and runny and you are running a terrifying 98.7 degree fever. If you or your loved one has one or more of these symptoms you may be suffering from the man cold. But take hope if you follow these 5 simple steps you will be fine. 1. Don’t Do Any Kind Of Work Or Activity- I don’t want to scare you but your life is being drained away as we speak. Every movement and every action that you take is stealing energy your body needs to survive. Do not get off the sofa or out of bed. Each step you take weakens you. 2. Sigh, Grunt, And Groan- In the sadly all to likely scenario that you DO have to do some kind of activity you need to make your every movement as audibly noticeable as possible. When you stand up you should sound like you are dead lifting hundreds of pounds. When sitting down you should sound like Atlas resting the earth off his shoulders. 3. Be As Grouchy As Possible- You probably have heard the old saying kindness never killed anybody? This is not true with the man cold. Being warm and inviting tells the virus you are a kind person and it should stick around. Conversely every time you get grouchy you tell the virus to get out of your system. Also as a side benefit your grouchiness should keep other potential victims away. 5. Ask For As Much Help As Possible- Guys I know we don’t normally like to ask for help. We are a tough breed that likes to do things ourselves. But this is serious. You must ask for help with everything. Is the remote control to far away, ask someone to pass it to you. Is your throat a little scratchy, ask for someone to make you tea. It is too hot ask someone to open a window for you. Did your blanket fall off your feet ask someone to pick it up for you. There is no task to small or to unimportant to ask for help with. The man cold is nothing to sneeze at. But you can make it through this. 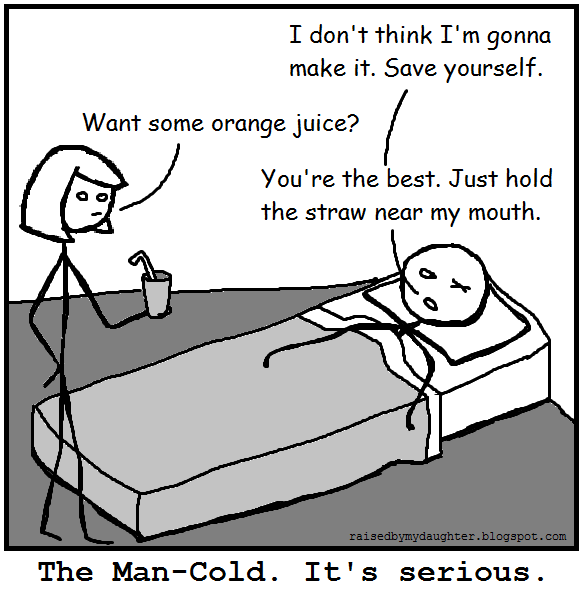 Just remember it’s not just a cold, it is a man cold. This entry was posted in Dad, Family, Men. Bookmark the permalink. Hahaha omg that’s hilarious. Pretty much what I witness all the time. I love it so much, I wonder if you would be ok if I reblog it? Thanks, we are big babies sometimes. I know poor girl right. Thankfully she woke up today with a non-man cold. I don’t know if she could handle Y attacking kind. The hilarious Dad over at https://modernmanofthecloth.com/ wrote a post today that actually had me laughing out loud. I’m sure you other Mama’s can relate to having to look after a man who has the dreaded, debilitating, how am I not dead yet “Man Cold”. Take a peek, and have a laugh. Laughter is always a great help this is very true! That’s what I think too, that I get the worst version of any bug going around. I am not sure why I am so unlucky in that manner. Hahaha! You must have got some of your tips from Dan. No, but I am glad to hear he knows how to take care of himself when this disease strikes.